Any DVD Cloner for Mac is a simple but powerful Mac DVD backup software. With Any DVD Cloner for Mac, Mac users can burn a dual-layer(DVD-9) or a single-layer(DVD-5) movie onto one dual-layer or single-layer DVD+R/RW, DVD-R/RW disc in 1:1 ratio. It would guarantee copied disc has the same video and audio quality to the source DVD. Besides burning DVD to blank DVD disc in 1:1 ratio, Any DVD Cloner for Mac also supports saving DVD to DVD Folder or ISO Image File. Any DVD Cloner for Mac supports compressing DVD-9 movies to blank DVD-5 DVD-R/RW or DVD+R/RW disc, lossless quality in video and audio. DVD-R/RW, DVD+R/RW are supported. Mac users can burn DVD with one DVD burner or two DVD burners. Any DVD Cloner for Mac could detect burners automatically. "Full Disc" and "Main Movie" are provided. Users can choose "Ful Disc" if want to get a full disc backup; choose "Main Movie" if want the main movie part only. Settings dialogue for Any DVD Cloner for Mac, temporary folder, copy method, and other advanced settings can be modified here. 1. Temporary Folder: can be changed by clicking "Browse". Make sure that the selected folder has sufficient space. For example, if you need to burn a DVD9 to a blank DVD9 disc, please select a folder with at least 8.5GB at least. 2. 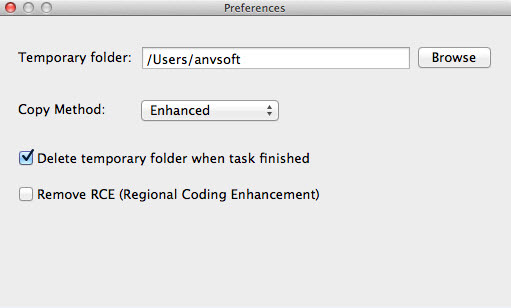 Up to users to check "Delete temporary folders while the copying is finished" or "Remove RCE". 3. Preview: Move mouse to click the title you want to preview once, make it highliht in blue, then click the "Start" button under the previwing window, the selected title will play immediately. 1. How to Burn DVD Movie to blank DVD disc(DVD5/DVD9) on Mac? Note: It's recommended to use Enhanced Open Method which may help you to find the exact real longest title among a list of potential fake titles. 1.2 Load Source DVD all titles by clicking "Open DVD". Choose the DVD drive or DVD burner where your DVD movie has been inserted into in "Input". Click "Open DVD", then program will start scanning and analyzing the DVD movie. All titles will be listed in the program. 1.3 Choose Output DVD Drive. Note: If you have more than one DVD drive, you can choose another drive in "Target" for burning DVD to blank disc. 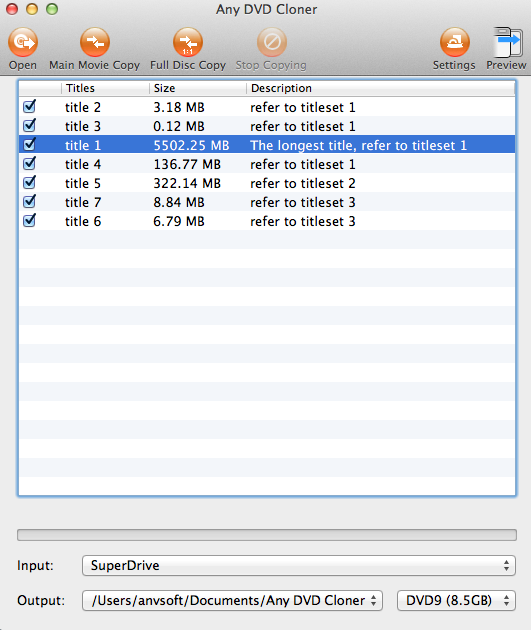 If you have only one DVD drive, just choose the same DVD drive to "Source". Burning a DVD to DVD/ISO Image File/DVD folder, temporary hard disk space will be required. If there is not enough temporary hard disk drive, DVD burning may fail (Tips: Temporary Folder can be changed by clicking "Settings". For burning a DVD9, 8.5 GB free space in hard drive disc is required. If the output DVD folder or ISO image is in the same drive as temporary folder, 16GB will be required. Click "Full Disc Copy" or "Main Movie Copy" tab to start the copying process. Note:If your DVD disc is not a blank disc, the program will prompt you to erase the disc. Click "Yes" to automatically erase the disc. Wait for a while, then a new DVD backup is created!